Welcome! As we dive into the intriguing waters of Advanced Races Compendium stretch goals, I thought it would be fun to tease something we haven’t announced yet. Who among you can guess what race’s chapter the following spell might be found in? I’ll just tell you, I had a blast working on this race, even though we knew it was a backer goal and might not be released ’til later. This book has groovy spells and not one, but TWO playable race builds! Think you know? Tell us your theories in the comment section, or be really bold and publicize your guess on Facebook! Don’t forget to link the Kickstarter page, though! You cause your targets to experience painful swelling from bubbles in their blood. 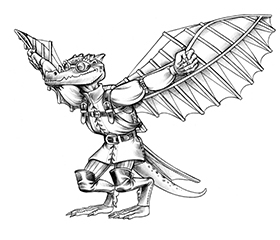 Creatures affected by the spell gain the nauseated condition and takes 1d6 points of Dexterity damage. A successful save halves the Dexterity damage and reduces the nauseated condition to sickened instead. At the spell’s conclusion, the Dexterity damage remains and heals normally. 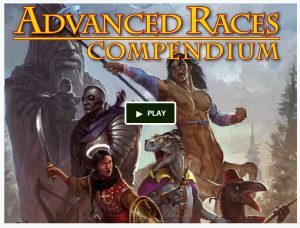 As of this writing, the Kickstarter for the Advanced Races Compendium has funded and a few stretch goals have been hit! Please consider joining in if you haven’t, and if you have? Definitely watch for more stretch goals!